The governing body of the UN’s health agency that sets the agenda of work on global health met late January. 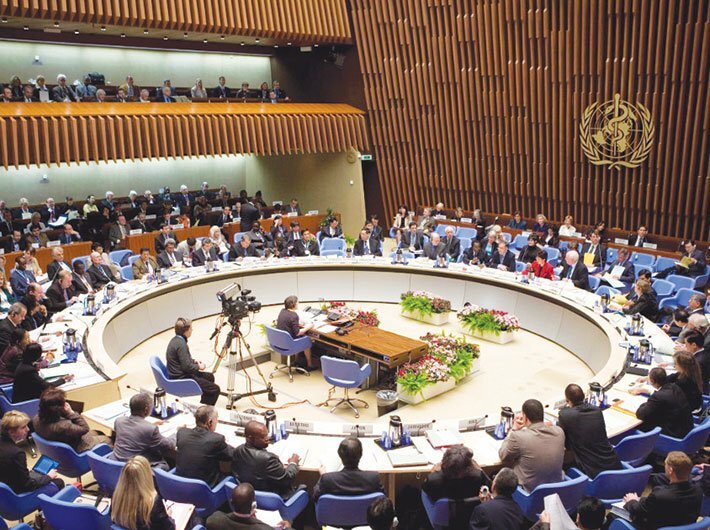 In its 140th session, the executive board (EB) of the World Health Organisation (WHO) had much to discuss and agree upon, including the job of narrowing a long list down to three candidates who would compete to become the next director-general (DG) of the WHO. India made several interventions over the course of ten days, particularly around the question of access and affordability of medicines​. The EB saw lengthy discussions around the issue of intellectual property rights (IPR) – the topic has always been contentious at the WHO. At the start of the EB meeting, India again raised its concern over the non-inclusion of a specific agenda item for discussion on the UN secretary-general’s High​-​Level Panel (UNHLP)​ on Access to Medicines​ report. India said that the UNHLP report addresses some “long-standing problems” facing medical innovation that pump up prices to unaffordable levels and hinder access to medicines. A recent UN General Assembly (UNGA) resolution on Global Health and Foreign Policy also encourages the discussion of the findings at relevant international forums. Even the World Trade Organisation’s (WTO’s) Council for Trade-Related Aspects of Intellectual Property Rights (TRIPS) and UNAIDS have initiated discussions on the report. As such, “it would be simply inconceivable and inexcusable that WHO, which has a constitutional mandate to set and coordinate global R&D efforts and which is the main UN agency that should be at the forefront of the access to medicines agenda, does not discuss and take appropriate follow-up actions on the UN High-Level Panel report,” India said. India had some additional harsh words for the UN’s health agency. “If the EB140 does not discuss the report, WHO risks losing its leadership on such a vital global health issue. This would be a serious setback to its credibility and integrity, particularly when it is trying to justify an increase in its programme budget,” an Indian official said. However, India’s request was turned down by the EB. The WHO refusal has a history to it. The UNHLP report on access to medicines published in September last year has emerged as highly controversial with many of the developed countries, particularly the US, having discredited the findings fearing negative impacts on the profits of their powerful pharmaceutical companies while developing countries, including India, have hailed its recommendations as crucial to addressing the global affordability of drugs and vaccines. The report, among other things, recommends that the UN secretary-general should initiate a process for governments to negotiate global agreements on the coordination, financing and development of health technologies, including a binding R&D convention that delinks costs of R&D from end prices to promote access to health for all. Some other recommendations which also merit immediate consideration are the following: governments should require manufacturers and distributors of health technologies to disclose to drug regulatory and procurement authorities information pertaining to (1) the costs of R&D, production, marketing and distribution of health technology being procured or given marketing approval with each expense category separated; and (2) any public funding received in the development of the health technology including tax credits, subsidies and grants. India, along with some South-East Asian nations and Brazil, Iran and South Africa, had made a formal request to the EB bureau to include the UNHLP report for discussion at the EB – something that had been refused by the WHO in October last year. A host of civil society organisations (CSOs) working in the field of public health had written to the WHO decrying its decision. On January 23, the day the ten-day EB session began, India said that it regrets that the request was turned down “without any plausible reason”. “We are trying to avoid a situation such as the UNHLP report where there is no consensus,” the US said during one of the sessions at the EB. “We are feeling that something we often have not done is take the innovators in the conversation, we need to talk to the innovators. We always talk about access, and we don’t recognise the impact of unintended consequences of innovation,” an American delegate said. The board chairman, Malta’s Ray Busuttil, said that there were already enough agenda items on medicine and the UNHLP report could be considered under one of them. Since there were vastly differing opinions on the report, there was scant chance of reaching any conclusion on it, he said. “We would suggest that WHO should establish and maintain an accessible international database of prices of patented and generic medicines and biosimilars in the private and public sectors of all countries where they are registered,” an official from India’s ministry of health told delegates on January 26. India also “urged” the EB to include a consideration in its programme review a 2003 WHA resolution that asks the WHO DG to monitor and analyse trade agreements that impinge on health needs. “Since the harmonisation of patent laws in 1995, the current monopoly-driven R&D system fails to prioritise public health needs. The lack of better norms and incentives for R&D causes the current imbalance in R&D priorities which leaves many people without treatment,” Medicus Mundi International, a network of organisations working in the field of global health, told WHO. “At the cost of repetition,” India said, it asks the WHO to “adequately respond” to the UNHLP and include it as a separate agenda item for discussion in WHA 2017. At the end, however, WHO relented to amend an existing agenda item on shortage of medicines at the next World Health Assembly (WHA) to be held in May this year that would include discussions on access to medicines. Brazil called this “the second best option” because the issue of access to medicine and shortage of medicine are not related and may end up with a skewed treatment of the access issue. WHO chose a small number of organisations at the EB with whom it would enter into official relations. The list includes award-winning organisation Knowledge Ecology International and the Bill and Melinda Gates Foundation. The inclusion of the Gates Foundation has rankled many CSOs from across the world prompting them to write a strong letter to the WHO to defer the decision to allow the Gates Foundation to have a say in policy matters and resolutions. Thirty international CSOs working on global health said that there is a clear conflict of interest in including the Gates Foundation in the UN’s work. The letter states: “According to the United States Government’s Securities and Exchange Commission, the Bill and Melinda Gates Foundation Trust endowment – the source of revenue for the Foundation – is heavily invested in many of the food, alcohol, and physical inactivity-related consumer products that cause or treat the current crisis of preventable heart disease, stroke, cancer, and diabetes.” It lists direct investments of the Trust in a Coca-Cola regional company, in Walmart which is also a leading retailer of pharmaceutical drugs and alcoholic beverages, Walgreen-Boots Alliance which is a large multinational pharmaceutical drug retailer and two of the world’s largest TV companies called Group Televisa and Liberty Global PLC. The 2015 tax returns of the Trust also shows it holds shares and corporate bonds in pharmaceutical companies such as Pfizer, Novartis AG REG, Gilead Sciences, GlaxoSmithKline, Abbott Laboratories, Roche, Novo Nordisk and Merck. “The Foundation’s proposed work plan incudes Malaria, Tuberculosis, neglected Tropical Diseases, Access to Medicines, Nutrition, Health System, etc. Tax return of the Trust clearly shows that the revenue of the Foundation is coming from investments in those industries that have commercial interests in those areas of the work plan,” writes Third World Network. Bill and Melinda Gates Foundation is currently the biggest voluntary donor to the cash-strapped WHO. The last EB also voted to shortlist three candidates for heading the UN’s health agency with its 7,000-plus employees. Ethiopia’s Tedros Adhanom got 30 votes, followed by Pakistan’s Sania Nishtar with 28 votes and Britain’s David Nabarro with 18 votes. Two European candidates – France’s Philippe Douste-Blazy and Italy’s Flavia Bustreo – were eliminated after one round of voting. There has been some aggressive campaigning by candidates starting even before the last WHA in May 2016. British politician Priti Patel tweeted a photo with Nabarro stating “Delighted to support UK #NextDG @WHO candidate @davidnabarro campaigning in Geneva”. Nishtar, who is Pakistan’s first female cardiologist and was also Pakistan’s candidate in 2015 for heading the UN Refugee Agency, has also been meeting foreign missions based in Geneva for her candidature since at least last May. In an attempt to bring in more transparency to the selection process of the DG, for the first time in WHA 2017, all the 194 member states will get to elect a new chief on a one-country, one-vote rule implemented through a secret paper ballot. The 69-year-old agency has had its eight chiefs drawn from just three of six WHO regions: the Americas, Europe and Western Pacific. The annual board meeting of the WHO considered a draft resolution that calls on countries to ensure the availability of the essential medicines and technologies for cancer management “through appropriate financing arrangements, measures to overcome patent barriers, quality assurance mechanisms, more effective supply systems and measures to reduce prices”. A WHO report under consideration highlights that of some 4.3 million premature deaths in 2012 that were cancer-related, 75 percent were in low- and middle-income countries. In 2012, there were 14.1 million new cancer cases and 8.2 million cancer-related deaths worldwide. Additionally, the number of new cases is projected to increase to 21.6 million annually by 2030. “The greatest impact is in low- and middle-income countries, many of which are ill-equipped to cope with the escalating burden of disease, and where 65 percent of cancer deaths occur,” the report says. The EU, during the negotiations, pointed out that unaffordability of cancer medicines is not confined to developing countries only – it plagues the developed world as well. Many countries, including India, took the floor to speak. India said that it is not in favour of the resolution covering human papilloma virus (HPV that causes cervical cancer) at this stage. However, consensus could not be reached on the resolution around intellectual property issues such as the inclusion of a reference to WTO’s TRIPS agreement and the de-linkage of prices of medicines from the cost of research and development. The matter will be discussed informally in the next WHA to arrive on a common language in the text. The EB is composed of 34 members who are are elected for three-year terms. The main EB meeting is where the agenda for the forthcoming WHA is agreed upon and resolutions for forwarding to the Health Assembly are adopted.